Yevgenia Chirikova, a former businesswoman leading a group of activists defending the Khimki forest, attributes her defiance of logging work there to her guerrilla genes and a chance stroll in the woods. “My grandfather was a partisan in Ukraine [during World War II]. No one drafted him when the war started. He just went to the forest and fought with whatever he could,” Chirikova told The Moscow Times in a phone interview, just an hour before leading an unsanctioned rally Thursday in front of the White House. The event, unsurprisingly, ended with a police crackdown and several activists detained. 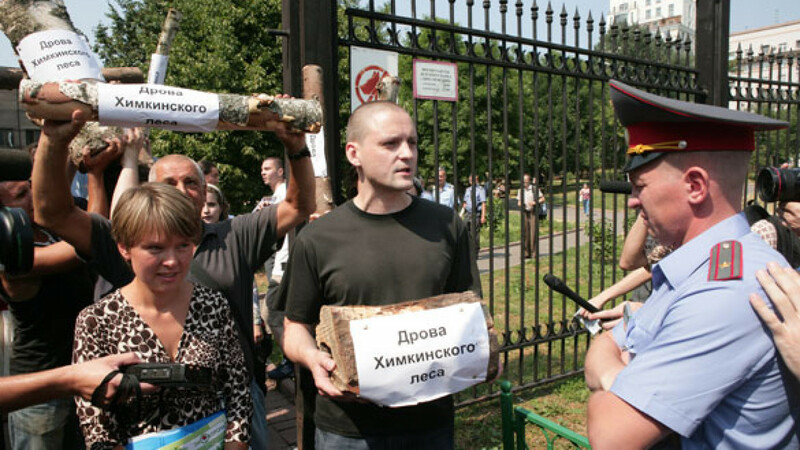 Fifteen activists, including Chirikova, were also detained Friday when they called police for help after being threatened by 100 masked men in the Khimki forest. “I am just really skinny, so they missed me,” Chirikova said after Thursday’s rally as she hurried to the police station to figure out how many of her colleagues had been detained. Chirikova, 33, a petite blonde with short hair, has an MBA and an economics degree. She’s happily married, with daughters aged 9 and 4. But some years ago, Chirikova decided to take up environmental activism. During a walk with her family in the Khimki forest, she saw the ugly red marks on old oak trees slated for destruction to build a new $8 billion highway between Moscow and St. Petersburg. At first, Chirikova said, she tried to find organizations that would fight for her cause, even offering money to Greenpeace. But they could not take up the job because they were already swamped with work. “I have realized that the only way to change something is to start doing it myself,” she said. Chirikova has employed different tactics in her fight, from living in the forest to organizing a rock concert and even running for mayor of Khimki, a city just outside Moscow. She had problems registering as a candidate and eventually lost, but still got a respectable 16 percent of the total vote in March 2009. She eventually decided to switch her focus from the unresponsive Russian authorities to foreigners, targeting the European Bank for Reconstruction and Development. The lender was a potential investor in the $8 billion highway project. Chirikova was among a few dozen activists to meet with the EBRD’s top management at this year’s annual general meeting. “They are a European organization. They care about risks to their reputation. They understand that they could get it in the neck … if corruption or environmental risks are involved,” she said. The bank has defended the road as an important development project, although it remains cautious on committing to financing the road. “EBRD strongly believes that this is an extremely important project for the Russian economy. It is a strategic project. The important question is how it is executed,” EBRD spokesman Richard Wallis told The Moscow Times on Sunday. “EBRD’s finances have been sought in connection with the project. It is studying it very carefully, but EBRD has made no final decision,” he added. Chirikova said she was well aware that her activism could land her in trouble. Mikhail Beketov, editor of the local newspaper Khimkinskaya Pravda and another vocal critic of the highway, was beaten up in 2008, receiving a brain injury and losing a leg. Police have not found the attackers. Chirikova said an unidentified man assaulted her earlier this month, hitting her and trying to run her over with his car. The man, whom she described as a 150-kilogram thug, came back a few days later, cursing and throwing his fists in the air. “I am not afraid. Because if I start thinking about it, I will not be able to do anything. But of course my family, my parents are worried,” she said.